This is how I would describe Bodyfood All Natural and all its wonders. In early 2017, I was on my phone browsing through all-natural remedies readily available in the country. Honestly, it was hard for me to just choose because I've always been the type to not believe what advertising / marketing dictates. I trust reviews and what people close to me tell. I trust in people's feedback ~ and through all the searching and swiping and scrolling, I finally came across one that I could trust. I messaged Teacher Ana of Bodyfood All Natural. I've seen some friends (online and offline) just raving about the power her products possess, and how intentional she was in making each one. I started reading more about it and contacted her so I can make my first purchase that I gifted to myself on my birthday: The Knotty Back Balm, Hair & Scalp Oil, and the Migraine Balm. After the first purchase, I couldn't help but buy more. Bodyfood All Natural is a homegrown brand created by Teacher Ana back in 2001 when she found the need to find something to keep her busy, but purposeful. She has always been drawn to scents, essences, to all things environmental and supporting local. She has always felt that the earth can heal us. She opened her senses to what it can see, taste, smell, and feel. Funny how she shared that she was born with a nose that can detect synthetics. Well, if you've tried her products, you'll really see the difference of things slowly created, making use of the elements your eyes can see, your body can sense. Bodyfood has allowed her to create with love, not just for her family (which originally was the purpose of her products), but for others who are like-minded. To find something that can change lives one balm at a time. Fueled by her advocacies, Bodyfood is a mindful brand that provides sensory products that nourish, that heals the body, and cleanses the soul. Ever since we purchased the first time, we try to incorporate Bodyfood All Natural in our lives. Whenever we're off to our next adventure, we never forget to bring our essentials. We've brought 'em to the waters of Palawan, old houses of Las Casas in Bataan, while doing a 4x4 in the sand dunes of Ilocos Sur, and much much more!! You never know what can happen when you're out, so better be prepared!! 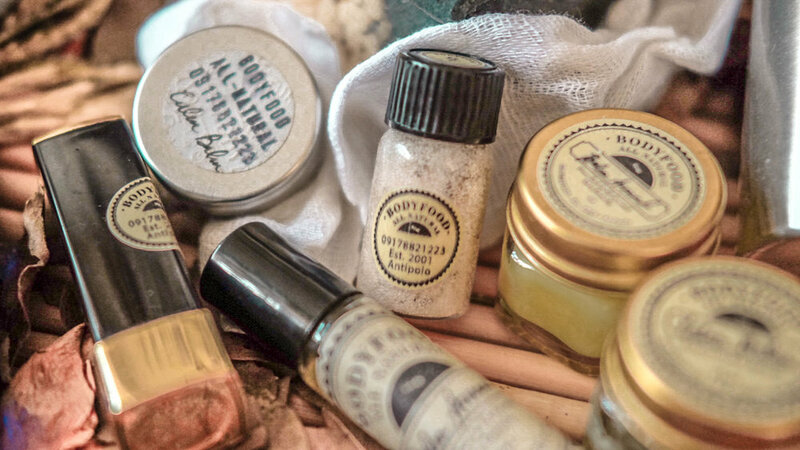 Bodyfood was the first ever homegrown, passion brand that introduced me to using natural such as handmade, cold-pressed soaps, balms, liniments and more!! All of Bodyfood's products are infused with lots of healthy raw materials (such as milk, shea butter, etc) and contains an abundance of premium essential oils. Never in my life did I imagine that I would be using non-store bought stuff. I mean, slowly, we're incorporating the more natural approach starting with what we bring during our trips. Instead of bringing containers of mainstream liquid soap, we would bring these soaps (placed in a tin container). I'm used to the convenience. I mean, if it was easier to buy sachets of soap, or drugstore balms to help with your needs, why wouldn't you opt for that, right? But iba talaga pag gumamit ka ng alam mong ikakabuti talaga ng kutis mo, at kalooban mo. Personally, I noticed how Yñigo's bites / scars / bruises would heal faster when I applied Bodyfood. I also saw how Bobby's & my skin changed after using BF soaps, and their Balm Around is the bomb. If I could buy a lifetime supply of Balm Around in this very moment, I would. Here's a few things we use. There are so much more to be honest. I even wasn't able to take a photo of my Hair & Scalp Oil (which has been a miracle worker with my sensitive scalp). I was always in need of a remedy to cater to my frozen shoulders and back. Being in front of the laptop all the time, with such poor posture, causes a lot of muscle ache. This was my first purchase ever. I've never been more satisfied with anything. The Bodyfood Manzanilla for tummy aches, Mosquito repellant for all the pesky mosquitos (I hate our son having bites cause they get inflammed), and calm balm for diaper rashes (or when I don't want to get headaches in the car). There are other things they offer such as face serums, perfumes, hair & scalp oil, candles, inhalers, cough syrup, shampoo, lip balms (another staple of mine) and more. There are special times that Teacher Ana puts up raw materials for sale ~ and if you know her, you'd know how reliable and premium these materials were. Personally, I've hoarded some beeswax before when I got into candle-making! She also offers wild honey, gugo, herm-infused oils, and more. Most recently, they've offered essential oils! That's it. I just wanted to share how happy we are with Bodyfood All Natural! Once the weather clears (and my savings fill up), I'll make my way up to Antipolo again to restock because having too much of Bodyfood is definitely the way to go!